Sportradar announced the expansion of their global board including four prominent international names: Tony Aquila, Marc Walder, Herve Couturier, and George Fleet. These four join shareholder representatives Carsten Koerl (CEO of Sportradar), Canada Pension Plan Investment Board (CPPIB), and Silicon Valley-based growth equity firm TCV on the Sportradar Group Board. 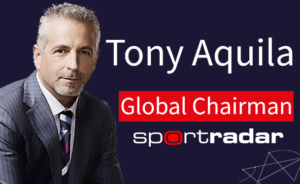 Aquila will serve as the Global Chairman of the Sportradar Group Board. He serves as Founder, Chairman, and CEO of Solera Holdings, a global technology company that develops next-generation solutions which manage and protect both businesses and consumers within the automotive, mobility, financial and cybersecurity industries in over 90 countries. He is an inventor with 100+ patents, serial entrepreneur and philanthropist who was named EY’s National Entrepreneur of the Year in 2013 in the Technology category. In July, CPPIB, through its wholly-owned subsidiary, CPP Investment Board Europe S.à r.l., and TCV acquired a stake in Sportradar at an enterprise value of EUR 2.1Bn (~USD 2.4Bn) from private equity firm EQT and certain minority shareholders. EQT also reinvested a portion of its sale proceeds into Sportradar. Additional existing shareholders include Revolution Growth, entrepreneur Ted Leonsis, basketball legend Michael Jordan, and entrepreneur Mark Cuban.